Hey there kids. 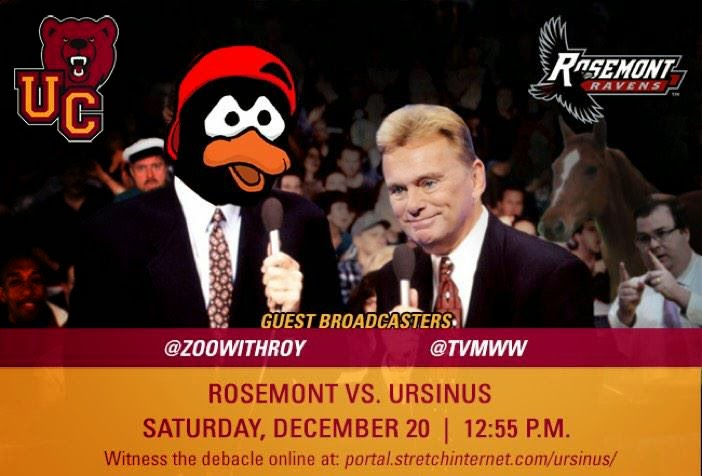 As you're well aware, The Evster and I were on the mic for this past Saturday's Ursinus vs. Rosemont (head coach: ZWR BFF Coach Hughes) NCAA basketball tilt, and we straight KILLED IT. "Srsly, ZWR? It wasn't a train wreck?" No!!! We really were great! Thanks to the tremendous efforts of our boy Wags (who put this whole thing together ... and hasn't been fired yet), we now have ready access to video of the FULL GAME BROADCAST. I posted it to the ZWR YouTube channel, so stop whatever it is you're doing- work, buying a Christmas present for your mom, watching your dumb children, whatevs- and experience again this Instant Classic (no srsly it went to overtime and had a dunk) right now! Embedded below if you're extra stupid lazy.